First of all, while our premium steel buildings are priced competitively, they also incorporate many top-quality features as part of the standard package which are not included in low-budget metal buildings. The RHINO Difference delivers greater durability, increased value, and far superior weather resistance to your new structure. After all, your new building—whether it is an agricultural, commercial, or industrial project, or for your own personal use—is an investment. You want the strongest, most durable building possible, and one that will retain its value, attractiveness, and functionality for the longest period of time. Prefabricated framing components with all the pieces cut to length, welded to shape, and drilled for simple bolt-together assembly. Clips already welded to the frames for easy attachment of girts and purlins. High-strength bolts and nuts for strong framing connections. Framing for a door opening up to 30’ wide. Fast delivery in 6-7 weeks from receipt of order (with some basic designs available in as little as 4 weeks). A guarantee that the framing will meet or exceed all local building codes for the lifetime of the building! Cover trim for all framed openings. Bill of Lading listing all parts shipped. 3 sets of Engineer-Stamped Plans with a Letter of Certification. A 49-page Installation Manual and a Construction DVD. RHINO’s metal building kits include self-drilling cast zinc aluminum fasteners. These long-lasting screws attach the Galvalume® sheathing to the steel framing. A lifetime warranty on these fasteners ensures no rust will form on the cast zinc head. Each self-drilling screw includes an abrasive-resistant EPDM sealing washer. These durable washers provide a waterproof seal even under extreme weather conditions. In addition, the washer also resists ozone and ultraviolet damage. The result is stronger and more durable prefab steel buildings. 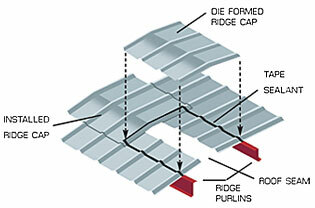 RHINO’s die-formed metal ridge caps conform to all standard panel shapes, providing a much snugger seal at the roof seam. This ensures a metal-to-metal contact for a tighter seal and improved pest control in RHINO prefab steel buildings. Another standard RHINO weatherproofing feature is the sealing system of specially designed foam rubber “closure strips” at all eaves, base, and roof. 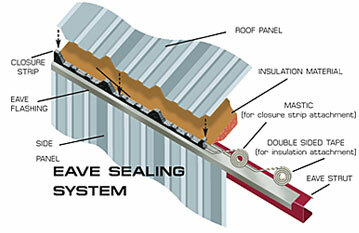 The mastic and double-sided tape for the closure strips is also included as part of the standard package. While our standard package works for almost every application imaginable, there are many options available from RHINO to further enhance your building to fit your specific needs in prefab steel buildings. See our Options Page for more information. Our top-quality product is just one part of The RHINO Difference. Another reason RHINO enjoys such incredible customer loyalty is out first-class customer service. Our friendly and experienced building specialists really know the metal building business—and the RHINO steel building system—inside and out. Each member of our sales team has many years in the metal building business, and the average tenure with RHINO is 10.3 years. That says a lot about the company and the caliber of its top-notch customer service team. They are prepared to answer any question you may have about prefab steel buildings. Over the years our building specialists have encountered almost every construction situation you can imagine, so they are well able to find a solution for your every need. They can assist you in choosing the right building, the right size, and with the right options to best accommodate your specific requirements for prefab steel buildings. Two things confirm customers notice and appreciate The RHINO Difference. First of all 39.1% of all our business in the past year has come from either satisfied customers returning to place new orders, or from first-time buyers referred to us by previous RHINO customers. It is a testament to our product and our service that RHINO has continued to grow and flourish in recent years, while many other metal building companies have closed down. RHINO has also earned an A+ rating from the Better Business Bureau. RHINO Steel Building Systems has been an industry leader in prefab steel buildings since its inception over 15 years ago. Thousands of RHINO steel-framed buildings have been erected in all 50 states, Canada, and Mexico. Our metal buildings can be shipped directly to you from multiple factories across the U.S. to reduce shipping costs. We have taken the time and resources to receive sales tax certification from every state which requires sales tax. We know your state and the business regulations it requires so you can successfully get your metal building erected. Share the post "The Rhino Difference"